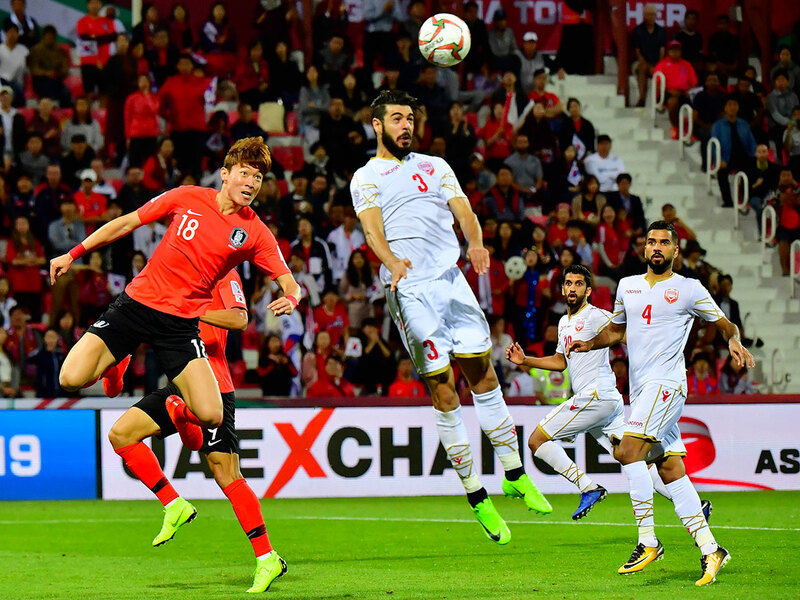 Dubai: South Korea weathered off a gutsy Bahrain 2-1 in extra-time to book a record 11th quarter-final AFC Asian Cup appearance in their Round of 16 encounter at Shabab Al Ahli Dubai’s Rashid Stadium, on Tuesday. Just when Hwang Heechan’s 43rd minute strike looked adequate, Bahrain drew level in the 77th minute to send the match into 30 minutes of extra-time. However, their ambitions were cut short towards the end of the first extra-time period when substitute Kim Jin-su ensured a rightful quarter-final spot for the Taeguek Warriors with a diving header. Runners-up to reigning champions Australia four years back, South Korea have been champions on two earlier occasions — way back in 1956 and 1960 — in Hong Kong and South Korea, respectively. Since then they have been regulars just falling short of the trophy with an Asian record of 10 quarter-final appearances since their debut in 1956. On Tuesday, led by Tottenham Hotspurs’ star Son Heung-min, the Taegeuk Warriors were left searching for a way through a tough Bahraini defence until Hwang’s goal towards the end of the first half gave them the edge. Playing against a team with a Fifa ranking of 53 compared to their No 113, Bahrain proved to be worthy opponents as they weathered off everything placed before them. In fact, the Koreans should count themselves lucky on at least a couple of occasions when Bahrain threatened. The first was in the fourth minute when Mohammad Jassim Marhoon’s fiercely struck volley whizzed past the goal and then in the 10th minute, Sayed Redha Esa’s try from the right was safely pouched by Kim Seung-gyu. Despite these early close calls, Korea continued probing towards the Bahraini goal and their first real chance came only in the 32nd minute when skipper Son put Hwang Uijo through, but the Gamba Osaka striker saw the delivery snatched by goalkeeper Sayed Shubbar Alawi. South Korea’s second opportunity came in the very next minute when a move from the right saw Hwang Hee-chan in the clear, but the midfielder who plays for German side Hamburger SV was crowded out by the Bahraini defence. The Asian Games gold medallists continued with their persistence and their patience was finally rewarded in the 43rd minute when a move initiated by Son saw Lee Yong send in a first-time delivery that deflected to the feet of Hwang who coolly placed inside an unmanned goal. Content with the lead, Korea allowed their opponents a bigger share of the exchanges while trying to catch them for a second goal on the counter. Bahrain goal survived on resumption when a 56th minute Jung Woo-young free kick from outside the area deflected for a corner. As the match wore on, the lower-ranked Bahrain started having a better share. They came close to an equaliser in the 70th minute, but Korean goalkeeper Kim flung himself to bring off a brilliant save off a Jamal Rashid Abdul Rahman curling try. The Gulf side finally drew level in the 77th minute when Mohammad Sa’ad Al Romaihi pounced on a hasty clearance from Hong Chul to bang into an empty goal. Bahrain’s best finish was a fourth place in the 2004 edition where the Reds beat Uzbekistan in the quarter-finals, before losing to Japan 4-3 in the semi-finals. Bahrain then went down to Iran in the third-place play-off, thus finishing in fourth overall making their coach Miroslav Soukup as for more.